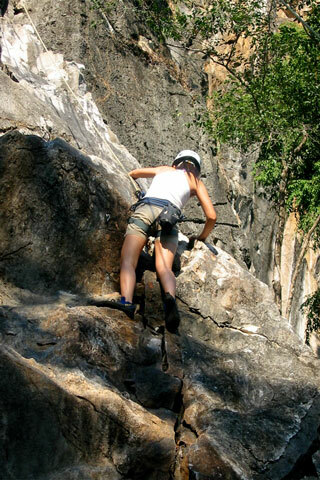 Chiang Mai might not immediately strike one as being a rock climbing hotspot along the lines of Krabi’s Railay for example but there are some good spots out among the limestone outcrops west of town and the very well organised Chiang Mai Rock Climbing Adventures Co offer a range of interesting options. Browse places to stay in Chiang Mai on Booking.com. Book Now - Pay Only When You Stay. Climbing sites are out in Sankhampaeng District with the star of the show being the locally famous “Crazy Horse” which, to quote Rock Climbing Adventures Co, who know far more about these things than we do, is “one of the most sustainable, fun and user-friendly crags in the world.” Must be good then! We confess to taking one look and opting for a beginner’s route further along the cliff and while we’re not certain how Crazy Horse rates on difficult levels they do cater for all levels of ability from beginners up and claim to offer an astonishing 200 and something different routes. Incidentally the Crazy Horse came about as the owner misheard a local climber describing the site as “crazy hot” and as he reckoned a prominent outcrop had a distinct horses head shape the name stuck. They offer a wide range of courses—all of which you can find very well detailed on their website—but which go for 4,995 baht for a one day introductory session, 12,995 for a comprehensive three day beginner’s course or 6,995 for what they temptingly call their “Anxiety State Crisis” programme with some serious overhangs and which we don’t reckon is for beginners, with other various options in between. All include return transport, lunch and full equipment hire and all are conducted with qualified guides. In addition Rock Climbing Adventures offer bouldering plus a range of combined activities programmes incorporating caving and rafting with climbing. Staff we met were super helpful with decent levels of English and the equipment looked solid and in good condition. Last updated on 17th June, 2017.